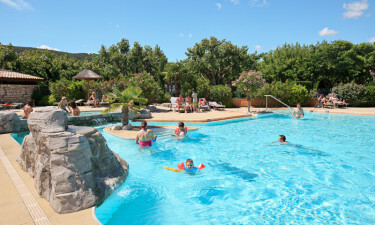 Located in the idyllic setting of the Eyrieux valley, L'Ardéchois campsite is the perfect place for a family holiday, especially for those who love nature and the great outdoors. Book a luxury mobile home at L'Ardéchois while there are still vacancies! 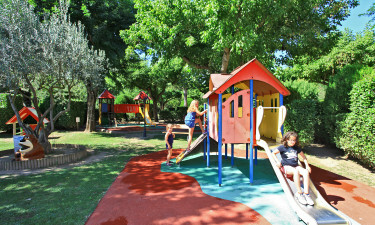 Why should I choose L'Ardéchois Campsite? 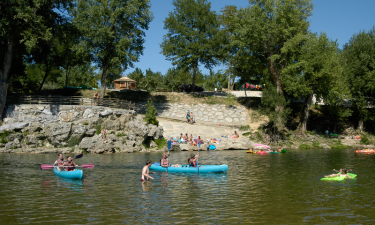 Camping L'Ardechois is absolutely ideal for family camping. Located in the tranquil, sheltered, and atmospheric surroundings of the Eyrieux Calley, the campsite is particularly ideal for those who enjoy the countryside and nature. The camping is situated about 8 kilometres from the village of Saint Sauveur-de-Montagut. The five-acre campsite is in the heart of a spacious park of 37 acres, which is full of wild flowers and full of sun, although shady areas are easy to find. The presence of the crystal clear waters of the Gluyere makes our campsite even more appealing. Every year, our holidaymakers create many magical memories of swimming or fishing in the river, or simply sunbathing on its sandy beaches. 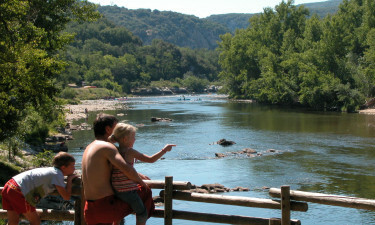 The campsite is located in the midst of the beautiful Eyrieux valley in the heart of the Ardeche. The valley is famed for its luscious greenery, enchanting chestnut groves and picturesque villages, which embody the unique character of the region. This charming rural area is ideal for activities such as kayaking and hiking; follow the course of the Eyrieux and admire the famous Pont d'Eyrieux. When you book a holiday with LUX-Camp, you can be confident in a holiday that is stress-free and convenient and the L'Ardechois campsite is no exception. If you want a camping holiday that is family friendly and has high-quality mobile homes, you will love our campsite at L'Ardechois! Wifi is available in our mobile homes for a small fee. We have plenty of things to do to suit all tastes at our campsite. At the height of the season, we have a live band playing every week, and an extensive entertainment programme with at least four activities on offer each day. As well as organised traditionally French games of petanque, we also have a bar with a billiard table, a large TV, and several arcade machines. There is a delightful swimming pool surrounded by sun loungers with a discreet changing area. On site, you can order freshly baked baguettes to be delivered to your mobile home each morning. There is a small grocery shop on site perfect for picking up those odds and ends- and a restaurant where you can order tasty hot meals or snacks. We also provide a takeaway service. 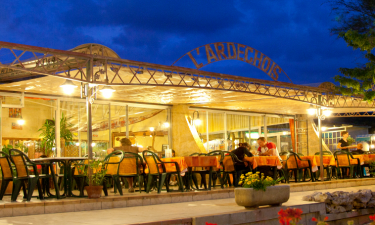 You could also explore the surrounding villages, where there are plenty of gourmet restaurants from which to choose.